A few days back I posted a silly infographic about being in a film noir. In the comments, Bill Ziegler suggested I check out Pat Novak for Hire, a radio show from the ’40s I knew nothing about. I checked it out. And it’s a great show. The stories are tight and off-beat, the tone is ironic in the way old hard boiled detectives were ironic. 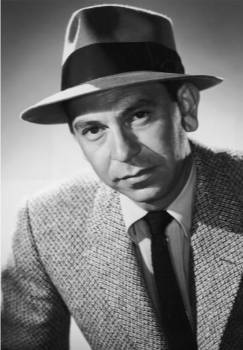 The stars Jack Webb in the titular role, and we all know Jack Webb from Dragnet. Pat Novak is a man for hire, an unlicensed detective, in the same vein of Travis McGee. The sort of character that I like very much. Two separate series were done – one in ’46/’47, and a later series in ’49 (with higher production values but basically the same cast). The scripts were by Richard L. Breen, that would go on to win an Oscar as the screenwriter of 1953’s Titanic. If you’re interested, you can legally download a fair chunk of the series through the Internet Archive. And a big thank you to Bill, for pointing me in the direction of this great show. Categories: Media | Tags: Film noir, Internet Archive, Jack Webb, old time radio, Pat Novak for Hire, Richard L. Breen | Permalink.